Boysenberry is the common name for a hybrid plant of the blackberry/raspberry genus Rubus and characterized by a relatively large fruit, with large seeds and a deep maroon or reddish-black color. Although its parentage is somewhat uncertain, it generally is considered to be a cross between a loganberry, a raspberry, and the Pacific blackberry. It generally is given the scientific name Rubus ursinus x idaeus. (R. ursinus is the scientific name of the Pacific blackberry and R. idaeus is the scientific name of the red raspberry.) The term boysenberry also is used for the fruit of this plant, which is aggregate fruit of numerous drupelets. It is classified as a blackberry because it keeps its core intact, rather than having the drupelets separate from the core, leaving a hollow fruit, as with the raspberry. Boysenberries, which offer a rich, sweet, and tart flavor, also are nutritious, being rich in vitamin C, fiber, calcium, and anthocyanins (which work as antioxidants), and a source of iron. The boysenberry is a human creation achieved through a selective crossing by a horticulturist (Rudolph Boysen) in the early 1920s. They were commercially cultivated and popularized by Walter Knott (whose farm became Knott's Berry Farm). This unique berry may be eaten fresh, used in jams, preserves, pies, and syrups, or even made into wine. 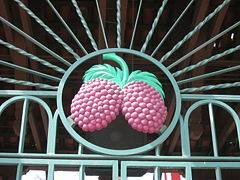 The gates at Knott's Berry Farm feature boysenberries. Rubus, the genus to which boysenberry belongs, is part of the rose family, Rosaceae. Rosaceae is one of the largest families of flowering plants with about 3,400 species, including apples, berries, peaches, plums, cherries, the hawthorn tree, the mountain ash, and many others. The genus Rubus is a very complex one, containing 13 subgenera and over three hundred known species. The raspberries, blackberries, and dewberries are common, widely distributed members of the genus, while the hybrid loganberry and boysenberry are also members of the genus. Most of the plants in Rubus have woody stems with prickles like roses; spines, bristles, and gland-tipped hairs are also common in the genus. The blackberries, as well as various other Rubus species with mounding or rambling growth habits, are often called brambles. However, this name is not used for those, like the raspberry, that grow as upright canes, or for trailing or prostrate species such as most dewberries, or various low-growing boreal, arctic, or alpine species. The Rubus fruit, sometimes called a bramble fruit, is an aggregate of drupelets. A drupe is a fruit in which an outer fleshy part (exocarp, or skin; and mesocarp, or flesh) surrounds a shell (the pit or stone) of hardened endocarp with a seed inside. These fruits develop from a single carpel, and mostly from flowers with superior ovaries. The definitive characteristic of a drupe is that the hard, lignified stone (or pit) is derived from the ovary wall of the flower. In an aggregate fruit composed of small, individual drupes, each individual is termed a drupelet. The "berry," thus, is composed of many connected druplets, which are individual sections of fruit, each with its own seed (Herbst, 2001). As an aggregate of drupelets, the boysenberry fruit comes from a single flower whose pistil is made up of a number of free carpels. The boysenberry is believed to be a cross involving the Pacific blackberry or California blackberry (Rubus ursinus, from western North America), the red raspberry (Rubus idaeus), and the loganberry (Rubus × loganobaccus, a hybrid produced from crossing a cultivar of a blackberry with a cultivar of a raspberry). Blackberries, which belong to the subgenus Rubus (or Eubatus), have drupelets that are attached to an elongated core that is removed with the fruit. In red raspberries and other species of the subgenus Idaeobatus, the drupelets separate from the core when picked, such that the aggregate fruit has a hollow core. The loganberry drupelets also stay attached to the core when picked, as with the blackberries. The boysenberry fruit tends to be glossy, large (eight grams), with a purple-red or reddish-black hue, and juicy, with a flavor somewhat similar to a raspberry with a more tart undertone (Smith 2008; Herbst 2001; ORBC 2008b). Although in common parlance, the boysenberry is considered a berry (any small, edible, fleshy or pulpy fruit with a number of seeds), it is not a "true berry." To be a true berry in botany, such as a gooseberry or grape, requires a fleshy or pulpy indehiscent fruit in which the entire ovary wall ripens into a relatively soft pericarp, and the seeds are embedded in the common flesh of the ovary. Aggregate fruits, such as the blackberry, the raspberry, and the boysenberry, which develop from several ovaries, are berries only in common parlance and cuisine and not in the botanical sense. The boysenberry was first cultivated in the early 1920s, by horticulturist Rudolph Boysen on his farm in California. Some place the date that this hybrid was created as 1923 (Herbst 2001; Smith 2008). However, sometime after developing this berry, Boysen, who was the city of Anaheim's chief horticulturist and park superintendent (Smith 2008), discontinued his experiments and sold his farm (ORBC 2008c). In the late 1920s, reports of a large, reddish-purple berry that had been grown on a farm by a man named Rudolph Boysen led George M. Darrow of the USDA to begin trying to track down this berry (ORBC 2006). In this endeavor, he sought the help of a Southern California farmer, Walter Knott, who was known as a berry expert. Although Knott was unaware of this new berry, he assisted Darrow in his search. On Boysen's old farm, they found several frail vines in a weed-choked field, and transplanted these vines to Knott's farm, where he nurtured them back to health and they bore fruit (ORBC 2006). Walter Knott became the first person to commercially cultivate this plant (ORBC 2008c). When he began selling the berries at his farm stand in 1935, he soon noticed the popularity of these large tasty berries. When asked what they were called, Knott said, "boysenberries," after their originator (KBF 2008). Today, all boysenberries trace their roots to these first plants (KBF 2008). Mrs. Knott used them to make preserves that helped to make Knott's Berry Farm in Buena Park, California, famous (ORBC 2008c). Boysenberries may be eaten fresh or used as part of jams, preserves, pies, and syrups, or made into wine. The growing season is short and boysenberries are not very stable once picked, making it important that fresh berries be eaten within two or three days of purchase (Smith 2008). They should not be washed until ready to use and stored in the refrigerators in a moisture-proof container to keep for two to three days (Herbst 2001). Boysenberries may be frozen and then thawed and used like fresh berries at a later time. Boysenberries are high in vitamin C, fiber, calcium, and anthocyanins, and are a source of iron (ORBC 2008a). Both Vitamin C and fiber have been shown to reduce the risk of certain cancers. Anthocyanins that work as antioxidants are known to help fight free radical damage in the body. The levels of anthocyanins in boysenberries (120 to 160 milligrams per 100 grams) is particularly high and are responsible for the deep, dark color of the berries. Measuring the antioxidant level of boysenberries according to ORAC (Oxygen Radical Absorption Capacity) indicates a value of 42μmoles/TE/gram, or almost double that of blueberries, which have a good reputation for their antioxidant properties. Knott's Berry Farm (KBF). 2008. The history of Mrs. Knott's chicken dinner restaurant. Knott's Berry Farm. Retrieved May 6, 2008. Oregon Raspberry & Blackberry Commission (ORBC). 2008a. Oregon's raspberries and blackberries. Oregon Raspberry & Blackberry Commission. Retrieved May 6, 2008. Oregon Raspberry & Blackberry Commission (ORBC). 2008b. Boysenberry characteristics. Oregon Raspberry & Blackberry Commission. Retrieved May 6, 2008. Oregon Raspberry & Blackberry Commission (ORBC). 2008c. Some berry history. Oregon Raspberry & Blackberry Commission. Retrieved May 6, 2008. Smith, S. E. 2008. What is a boysenberry. WiseGeek. Retrieved May 6, 2008. This page was last modified on 22 June 2016, at 15:43.